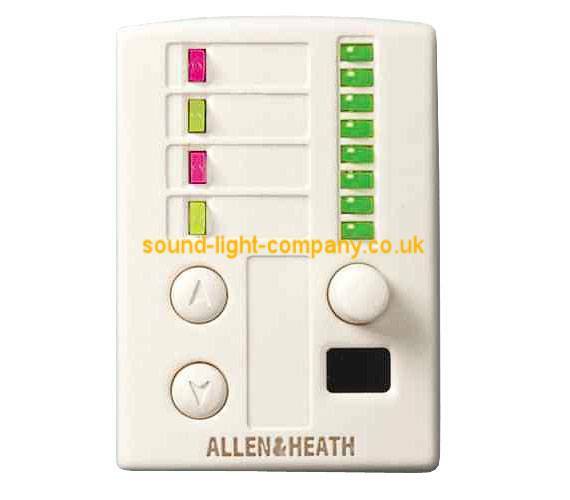 The PL-4 wall plate has 2 programmable switches, 4 programmable tri-colour LEDs and a rotary control with LED ladder. It has a built-in infra-red receiver, allowing it to be operated at a distance using the PL-5 handheld remote controller - these control options can be different to those set on the PL-4. PL-4 is ideal for local operator control of iDR-based audio systems. They may be used, for example, for source selection for an output zone, or for local volume control. Introduction The PL-4 is one of several remote control devices available for the iDR audio mix processor system. It is a wall plate or furniture mounted module comprising plastic control panel and attached circuit assembly. It can be mounted in a single unit wall box using a standard face plate (UK, EU or US version supplied). A suitable template with cutting details is provided for custom application. The PL-4 interfaces with the Allen & Heath PL-Anet serial port. Multiple PL-4 units can be daisy chained together along with other PL-Anet devices using CAT5 cable. The wall plate control and indicator functions are programmed using the iDR System Manager software. Space is provided on the control panel for custom labelling. The PL-4 is ideal as a wall mounted room remote controller in installed audio systems.The installer can program the unit so that the non-technical operator has local control of volume, mute, source select, and preset changes which reconfigure the room for different functions, as well as the convenience of the PL-5 infrared remote controller. 2 switches can be assigned for level up or down control (input, output, crosspoint or group), mute toggle, audio monitor select, or preset recall. 4 LED indicators can be assigned as audio meters (choice of 8x points in the signal path), mute status, or as preset related static display. They can display four states: off, green, yellow or red. Rotary control can be assigned as a continuous level control (input, output, crosspoint or group). An 8 LED meter bar displays the control position. Infra-red controller allows wireless local control using the hand-held PL-5 remote controller. Each of the 14 keys on the PL-5 can be assigned in the same way as the switches described above. The PL-4 can be used without the IR controller. Recessed areas are provided for fitting custom adhesive labels. Recommended maximum label sizes are 6x14mm and 26x9mm. Number and addressing of devices:- the maximum number of PL devices that can be connected depends on their type and the cable lengths. Up to 12x PL-4 devices (more if using half speed scan) may be connected in an iDR system, with or without the PL-9 hub. Fewer devices may be connected if long distances or other PL types are also involved. The iDR allocates the device addresses automatically per PL type in the order they appear in the chain.